Ten-year-old Christopher yearns for stories that are real; truth, not fiction. "'Remember, Mom? I don't like fairy tales anymore, ' Christopher said with a sigh. "So Mom and Dad tell Christopher the story of the very first Easter, and the sorrow and joy of Jesus' trial, death, and resurrection. Christopher learns important details about this miraculous event that help him understand the season's celebration. And he discovers his own special link to the very first Easter. The award-winning team of Paul L. Maier and Francisco Ordaz work together again to bring children ages 9 to 12 a vivid picture of Jesus' last days on Earth. 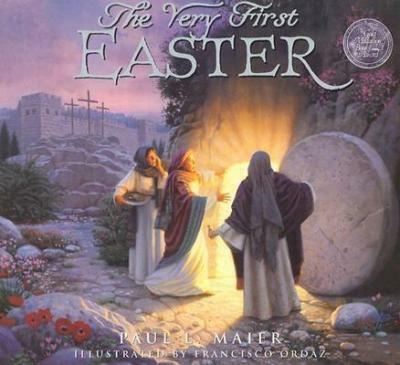 "The Very First Easter makes a wonderful gift for children, families, and friends. Paul L. Maier writers, "These pages return to the sacred focus on the true Easter story that is so often missing on literature for the young. This book answers the real questions children ask about Easter."